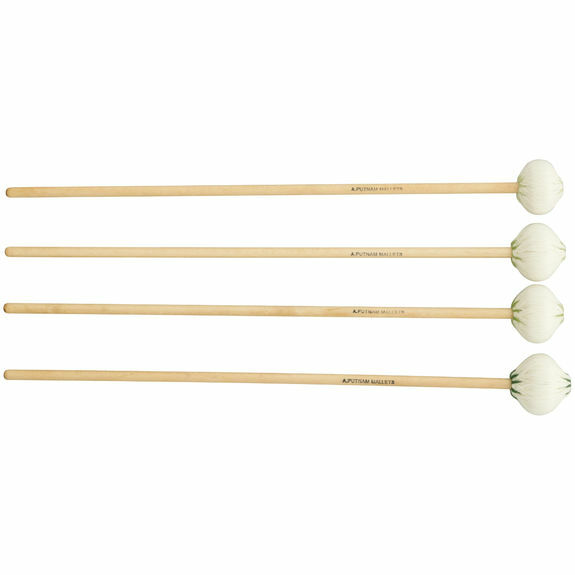 This graduated set of four staccato marimba mallets comes on handles made of North American birch (16″L × 5/16″ diameter). The new “cherry satin” finish has a non-slip grip and keeps the handles looking like new for years. A new color-coding system distinguishes the bass, mid-range, and soprano mallets for ease of set-up. Wrapped and sewn with off-white European wool and nylon blended yarns, these mallets offer both durability and minimal contact noise. This set works well for solo marimba repertoire in the lower to upper ranges and have a rich, warm medium sound. Designed and hand-crafted in the USA. These mallets are light, a little bit shorter than average (but not enough to notice unless you are playing a piece with numerous large intervals) and have disc-shaped, rather spongy cores which I assume to be wrapped in latex. They do not produce the volume associated with heavier mallets of similar hardness (they are lighter than Malletech's ES12, any Marimba One mallets, and even Encore's Nanae Mimura line); however, they also do not have the same chunky sound in the higher register associated with heavier, larger-core mallets. For their weight, their tone is very satisfactory, being clean, crisp, and a little mellower. They speak well in the whole middle range. A word about the graduation: in the higher register, all four mallets sound pretty similar, but in the lower register, the smallness of the highest mallet makes it much sharper-sounding. Overall, I'd suggest using these mallets on a marimba with narrower bars, as narrower bars generally require less weight to produce a full sound. 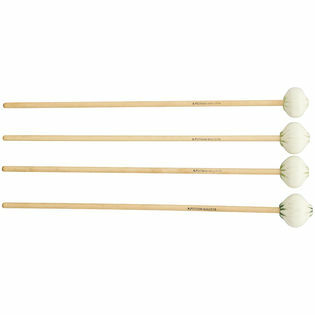 Very full sounding mallets, works well with the middle range of the marimba. Very warm sound with lots of fundamental. The only complaint I have is that the handles are a bit shorter than average. and the core (latex?) will deform/harden over time making it impossible to revive/rewrap. I will definitely buy these again.